The announcement comes as a surprise. Two weeks after Bread & Butter, Desigual has announced the departure of its CEO and shareholder Manel Adell. He will leave his position in January 2013 “to start new professional and personal projects.” The manager had joined the Spanish brand in 2002 and brought it to the milestone of 500 million euros sales in 2011. For 2012, the company is set to reach 700 million. In Berlin, in early July, Manel Adell attributed this growth to international development, the launch of new product categories and e-commerce. In terms of development, Desigual now has its sites on Latin America, after having taken on the United States and China. “We will be opening up offices in Mexico and Brazil. We already have personnel in place who will be focusing on wholesale. It is going to be a big project for 2013,” said Adell. In Europe, Desigual was used to managing the company from Barcelona, but this spring the brand restructured its teams for the German, Italian, Spanish and French markets. In France, Eric Modesto took on the new role as head of wholesale. Each of the three markets represents about 100 million euros in sales, as demonstrated by the locations of the brand's 300 direct-owned store—13 are in the U.S., 7 are in Asia whereas the rest are in Europe. “In 2011 we opened 65 stores, about half of which are located in Spain, France, Germany, Italy and Austria and Switzerland,” he said, adding that the share of e-commerce is expected to rise from 3-4% to 10% in the medium term. The other work in progress is moving the company’s headquarters but especially the expansion of its logistics capabilities. Desigual has purchased an 80,000 square meter lot to build a 120,000 square meter storage facility. Its current warehouse is 30,000 square meters. The first phase of construction should be completed in 2014. “The first phase will double the current capacity. All totaled, we invested $100 million in this logistics hub project," he said. Even though he is leaving in January 2013, Manel Adell recalled Desigual's goal to pass the one billion euros mark in 2013 or 2014, compared to the company's 300 million turnover in 2009. Desigual announced on Monday that Manel Jadraque is stepping down from his position as CEO. Jadraque, who has spent over ten years at the label, was promoted in early 2013. After the arrival of former Louis Vuitton exec Jordi Constans, Spanish fashion and fragrance group Puig welcomes ex-Desigual head Manel Adell to its board of directors. 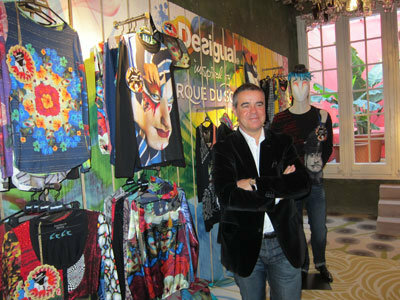 Manel Adell is stepping down as CEO of Desigual in January 2013. At Bread & Butter, he was still talking in great detail about the company's roadmap: entry into Latin America, new logistics tools, opening flagships. After shoes, Desigual expands its range to household linens. The next logical step: Maison & Objet.